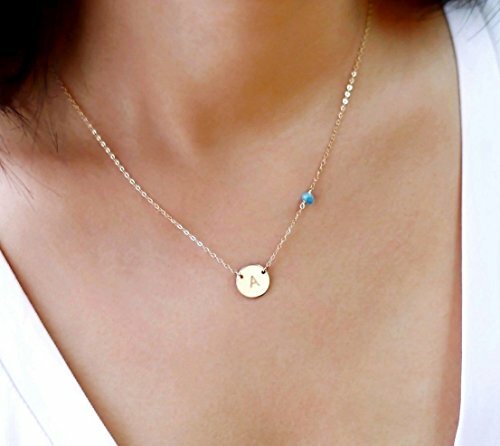 Delicate Initial Pendant Necklace in Silver, Gold, Rose Gold Circle Disc and Gemstone Necklace. Personalized Minimal Necklace with Turquoise Birthstone Jewelry ...................................... Small natural gemstone/birthstone or Swarovski crystal bead of your choice ...................................... Thick Medium size disc (approx. 7/16" OD) ...................................... High quality solid 925 Sterling Silver, 14K Gold Filled or 14K Rose Gold Filled for quality heirloom not plated or vermeil (is hypoallergenic, safe for sensitive skin) and made in USA or Italy, will last for years with proper care ...................................... Jewelry will come in a beautiful package without an invoice, ready for gifting ...................................... End to end length is the total length including the disc and stone/bead ...................................... Handmade, handcrafted in the USA ...................................... First sample picture: Gold - Shiny texture - Character: A - Font #2A - Stone #325 (turquoise) - 17" end to end length ...................................... You can add a 2nd circle disc next to the 1st disc or a 2nd stone on the opposite side of the 1st stone by purchase the option at bottom of the lsiting. If you have any questions about this product by HotMixCold, contact us by completing and submitting the form below. If you are looking for a specif part number, please include it with your message.